With its sandy beaches and bohemian charms, surfers and suits alike consider Folly Beach to be one of South Carolina's most historic and romantic spots. It is also the land where the ghosts of Cate Cooper's past roam freely. Cate never thought she'd wind up in this tiny cottage named the Porgy House on this breathtakingly lovely strip of coast. But circumstances have changed, thanks to her newly dead husband who has left her homeless, broke, and unmoored. Yet Folly Beach holds more than just memories. Once upon a time another woman found unexpected bliss within its welcoming arms. An artist, writer, and colleague of the revered George Gershwin, Dorothy Heyward enjoyed the greatest moments of her life at Folly with her beloved husband, DuBose. And though the Heywards are long gone, their passion and spirit lingers in every mango sunset and gentle ocean breeze. And for Cate, Folly, too, holds the promise of unexpected fulfillment when she is forced to look at her life and the zany characters that are her family anew. To her surprise, she will discover that you can go home again. Folly Beach doesn't just hold the girl she once was ... it also holds the promise of the woman she's always wanted  and is finally ready  to become. The book opens with an ode written by Dubose Heyward. Who or what was he celebrating? How do these lines set the tone for the story that follows? Think about the structure of the novel. Why did the author choose to intersperse Cate's "play" about Dorothy Heyward throughout the story. What did the two different narratives add to each other? Compare and contrast Dorothy and Cate. What role did the Porgy Cottage play in their individual stories? What significance did Folly Beach hold for each woman? Dorothy and Cate reminisce about the gossipy, judgmental behavior of the Lowcountry locals  "the Lowcountry jungle drums." What is it like to be an outsider living in a tight-knit community like Folly Beach? What was it like for Cate, Dubose, Dorothy, and even her Aunt Daisy and Emma to be insiders but to be different from other insiders? What are the ways that people cope with being different? Though they lived on a tight budget Cate, Dorothy, and Dubose added glamor to their lives through small things. What are some of the nice touches they included to add sparkle to their days? What inexpensive things do you  or could you  do to add a little beauty or glamor to your own life? Even before her husband's death, Cate felt like a woman without a purpose. How does she eventually discover what she's meant to do? Do you have a purpose  call it a passion  and if so what is it? If you're still searching, how might you find your way  or what advice would you offer to someone else seeking her purpose? Patti reminds her sister Cate that "doors close so that others can open." What doors opened for Cate with her husband's death? How can we keep ourselves open to new opportunities in the face of overwhelming loss? Dorothy believes in the hand of fate. Does Cate? What about you? Do you believe in coincidence? What is fate? What does it take to recognize it and how can that recognition shape the course of our lives? Both Cate and Dorothy talk about daydreaming. Do you daydream? What do you think about? How can daydreaming deepen our lives? How might it hold us back? 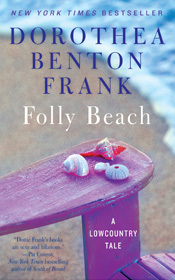 Family is an important theme in Dorothea Benton Frank's novels. What makes families so compelling to write about  and irresistible to read about as well? Talk about Aunt Daisy and Emma. What are their lives like? What challenges might they have faced in the past? If God is about love than why do so many faithful deny affection that beyond what is considered to be traditional? Discuss Cate and John's relationship. What draws them together? Do you believe in love at first sight? Compare their love with that of Dorothy and Dubose. Cate and John fall in love in the second act of their lives. Is it easier or more difficult to embrace passion for a person to embrace passion later in life? What makes them work so well together as a couple? The Lowcountry of South Carolina is central to the author's novels. What is it about a place that captures the imagination? How does place define a person? How would you describe your home and how it's influenced who you are? Cate discovered a wealth of interesting characters when she began reading about Charleston. How much do you know about the history of where you live and the people who once inhabited it? Uncover an interesting tidbit and share it with your group. Dubose was part of the Charleston Renaissance. Did you know anything about it before reading Folly Beach? Does their work have relevance for our lives today? A few times through the book, Cate is asked why she didn't know about Addison. Why didn't she see the signs? Think about people in real life caught in similar circumstances. Can we be deceived even if we try to be vigilant? Dorothy's story takes place nearly a century ago. How has our society changed from Dorothy's? Would the same rules still apply today? How did that change happen and what is different about us  or not  today? Cate is shocked when she learns that Dorothy's letters to Dubose are missing. Do you think Cate is right, that she sacrificed herself to ensure that her own husband's genius would be recognized? Why would a woman do such a thing? Would you? Though she was far thinking and liberated, Dorothy was still a woman of a particular time. Would an ambitious woman in twenty-first century America make the same choice? Throughout the novel, Cate and a few other characters offer pearls of wisdom about life and how to live it, for example, "Krispy Kreme. Every girl should have a guilty pleasure, no matter her age." What are some other insights that they offer? Have you seen Porgy and Bess or listened to the soundtrack? What made this musical so revolutionary in its day? Before you talk about Folly Beach, have a viewing of the film version of Porgy and Bess with your group. During your meeting, play some Gershwin  the Porgy soundtrack or other songs he composed. You can also bake a few delicious pies and cakes like Emma or mix up some cocktails in a vintage shaker from the 1930s. Use your imagination for a wonderful Folly Beach talk!